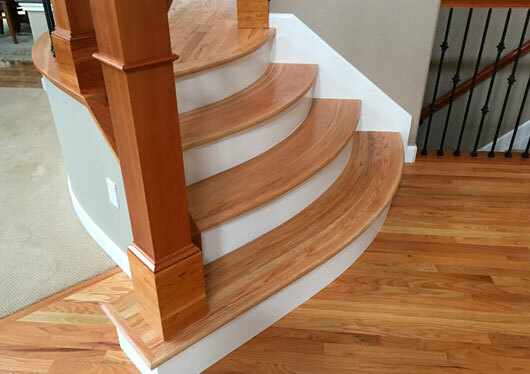 We have done many, many different styles of stairs with every imaginable type of wood. 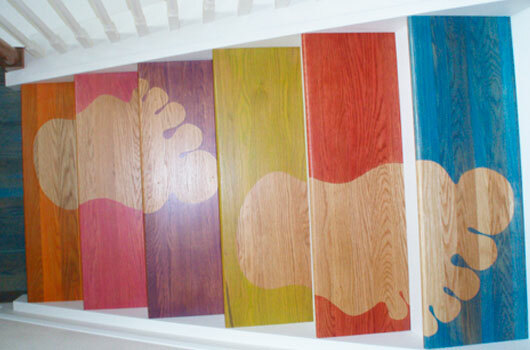 We can install custom railings, unique designs on landings, and do custom stains such as the colorful footprints we did on one set of stairs for a lady in Boulder, Colorado. 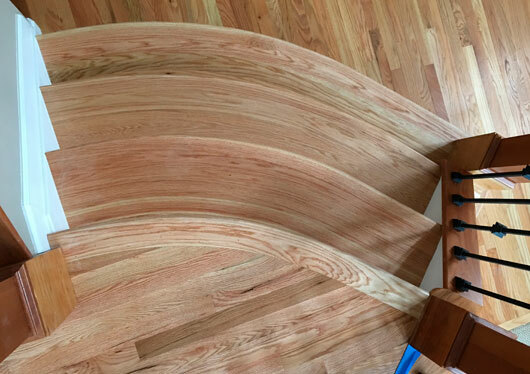 The pictures below are of a curved landing with three curve steps and a flight of stairs. The three nosings were laminated into one curve peace. It was a bit of a challenge, but yet it was fun. 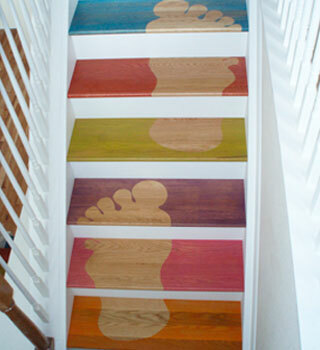 The steps were old carpeting when we started. 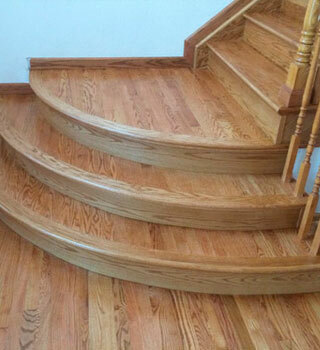 Now they are solid oak steps with end caps, oak risers, we even covered up the sides that were old beat up pine and now are oak. 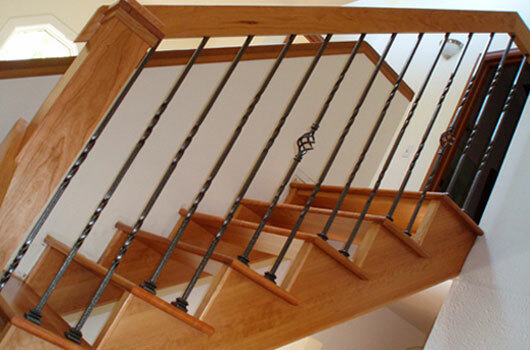 We removed the old balusters and then reinstall them at the end of the job. 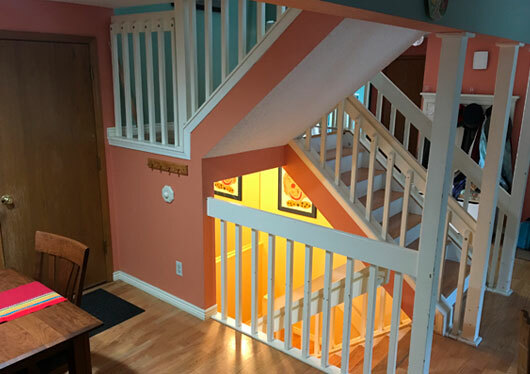 We also installed new flooring in the dining room, upstairs hall and living room, patched some flooring in the kitchen and then re-sanded the nook, kitchen, entry and added a light stain. 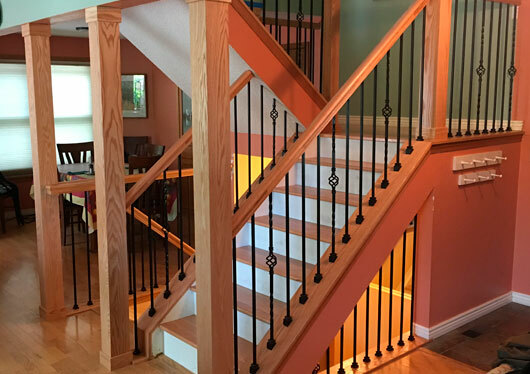 We used Glitsa Swedish Finish. 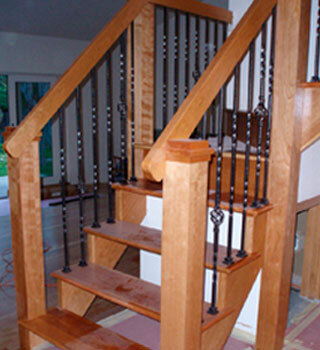 Some custom carpentry work we can do in our shop, prefinish it and bring it to your house ready to install. 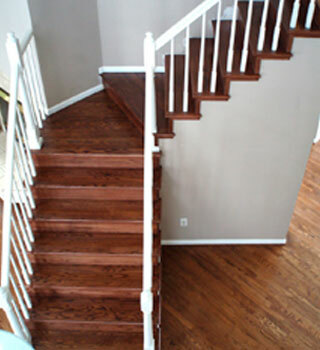 This project was a little outside the realm of what we generally do as a flooring company. But it was a very fun project to do. 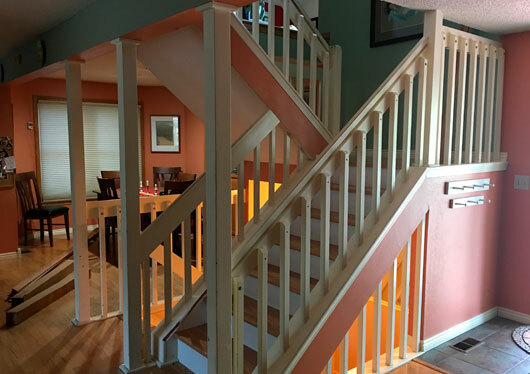 Everything you see in the picture that was painted white was removed and replaced with solid red oak.The only thing that wasn’t removed was five posts that were supporting the upstairs floor. Those five posts were wrapped with solid red oak. 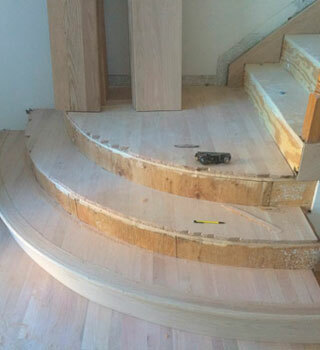 All the oak was finished By DC Hardwood Flooring with three coatsof clear spray lacquer. 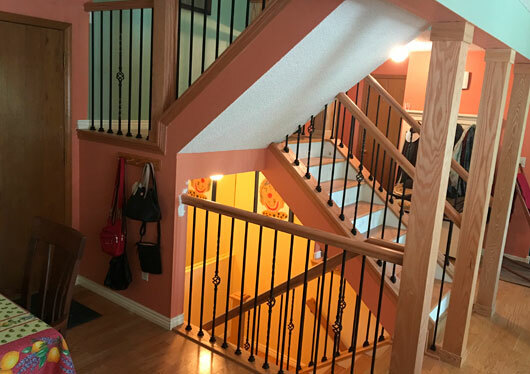 The painted white balusters were replaced with rod iron. Wow what a difference! Not too often but every once in a while a project comes along that is not only fun, but challenging. 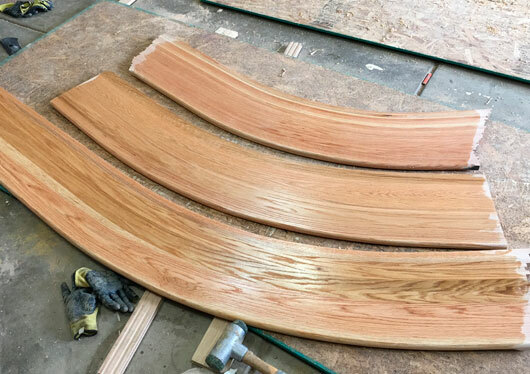 Here in the picture as you can see that these steps are solid 1 inch red oak glued together in strips to the contour of the staircase that they were going to be installed. Let me tell you I almost used a full gallon of glue for this project. 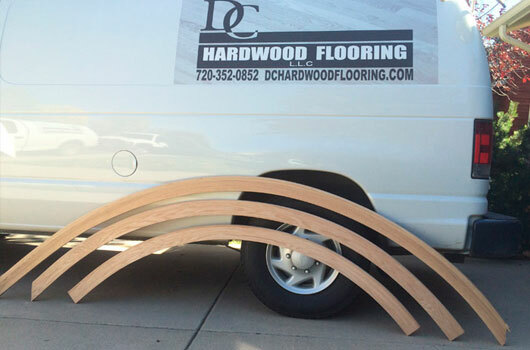 This method of gluing up wood was taught to me way way back in junior high when I took woodshop in school. 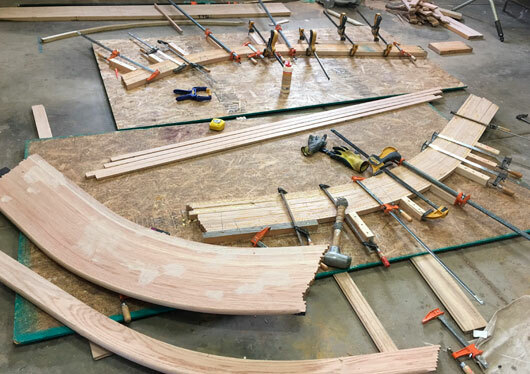 One of the things that I like about working with wood is that the methods have not changed through the years. Old school still applies. It was a treat to do.